Spokane Public Schools has been hit the hardest, with six schools on the list – Stevens Elementary, Balboa Elementary, Regal Elementary, Rogers High School, North Central High School and Lewis and Clark High School. There are 14 schools in the district that have at least one case of the mumps, and warning letters have been sent home to parents, Morrison said. 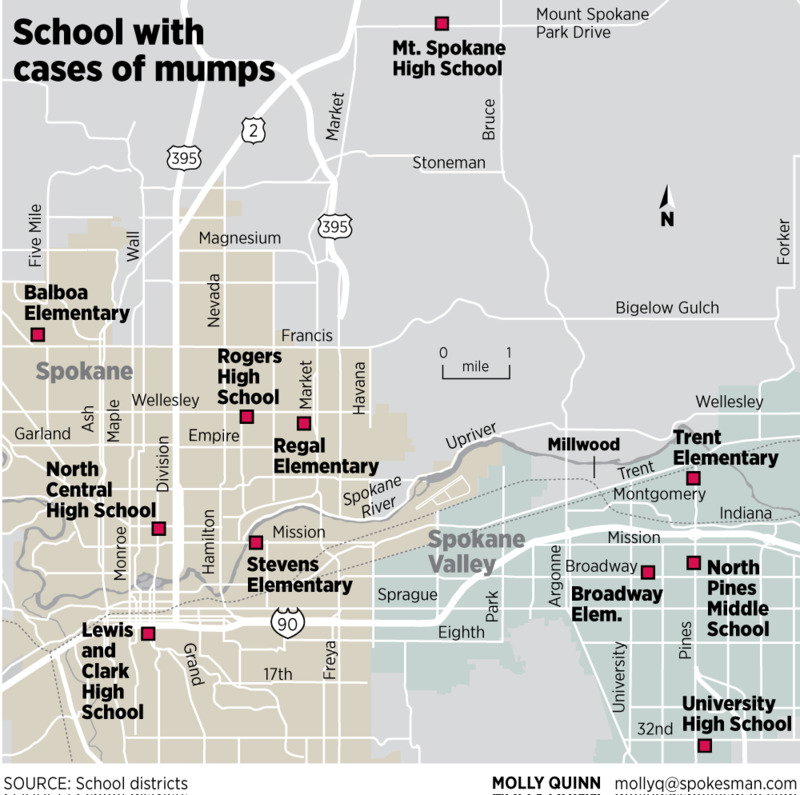 There are now 62 confirmed and probable cases of the mumps in Spokane County, according to the Spokane Regional Health District. Forty-five of those are in children ages 2-19 and 38 of the total number have occurred in vaccinated people. The other 24 cases are either unvaccinated or unsure of their vaccination status. Two doses of the measles-mumps-rubella (MMR) vaccine are recommended, the health district said, and will prevent the disease 88 percent of the time. During an outbreak, the heath district has the authority to order unvaccinated students and staff to stay home for 25 days. Any school with two or more confirmed cases of the mumps is put under an exclusion order to force those who have not received the MMR vaccine to stay home. “We’re seeing even more than two in a lot of the schools where we have the exclusions,” said health district spokeswoman Kim Papich. The health district has been partnering with local pharmacies to offer vaccination clinics for students and staff at the affected schools. The clinics are not open to the public. There are three confirmed cases at North Pines Middle School in Central Valley School District, and on Thursday, University High School and Broadway Elementary were added to the exclusion list. District spokeswoman Marla Nunberg said there’s no firm number on the number of students affected because students are updating their vaccination records and getting MMR shots before the exclusion order begins. So far Trent Elementary is the only school in the East Valley School District on the list. In the Mead School District, Mt. Spokane High School has been on the list and a second Mead school was added Thursday. The health district does not release the names of the schools impacted, Papich said, and representatives of the district did not respond to phone calls seeking the name of the second school on Thursday. Published: Jan. 19, 2017, 6:18 p.m. Updated: Jan. 19, 2017, 10:35 p.m.